In 1763, Hume journeyed to Paris with the Earl of Hertford to become Secretary to the British Embassy. His fame was now well-established in intellectual circles and he found easy entry into Parisian society where he charmed people with his gentle and joyous nature. In 1766, he returned to England, bringing the persecuted Jean-Jacques Rousseau with him. Hume’s plan was to help establish Rousseau following his political banishment from his home in Switzerland. Rousseau (1712-1778) was a major Genevan philosopher, writer and composer. His political philosophy heavily influenced the French and American Revolutions and the overall development of modern political thought. In 1769, Hume tired of life in England and returned again to Edinburgh and to the company of numerous friends. At this point his major works were being re-printed including an edition of his History of England and his Essays and Treatises. Very shortly before his death on the 25th August 1776, he finished his autobiography entitled ‘My Own Life’. This was finally published the following year thanks to his good friend Adam Smith. 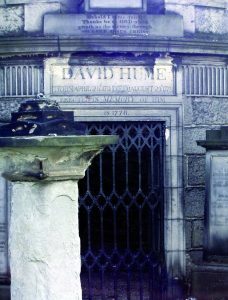 Hume’s mausoleum on Calton Hill, Edinburgh was designed by Robert Adam. It bears, as he requested, simply his name and dates. Some of his writings were not published until after his death, because of the hostile reaction they were expected to stir up. His two essays on suicide and immortality were published in 1777, without author’s or publisher’s name, and his nephew published the in 1779. The foundation of all Hume’s philosophical works is his theory of how it is we come to understand things. His original and subsequent re-writings were devoted to this very question and it is what, unquestionably, established him as an outstanding philosopher.